A traveler has been stuck to the ground by police at Dublin Airport subsequent to coming up short on the terminal towards a plane and yelling at the pilot to pause. The episode happened without further ado before 07:00 neighborhood time on Thursday. Minutes sooner the man in his 20s, who is believed to be Irish, was inside striking against the window of the terminal requesting that ground group hold the plane. He made it to the navigating Ryanair air ship before police captured him. A ground group part said the man "just kept running from the working towards the plane," which was withdrawing for Amsterdam.An observer disclosed to Irish state supporter RTÉ that the man was "very decided" to make his flight, including that he kept running towards the plane "with his bag under his arm". BBC News NI's Declan Harvey, who was at the scene, said that when police landed there was a fight and the man was stuck to the landing area. Two squad cars and a police van managed the occurrence. The man was captured, taken to Ballymun Garda Station and is required to show up at Dublin's Criminal Courts of Justice in the blink of an eye to deal with indictments associated with the incident.The flight left 21 minutes behind timetable. In an announcement, an air terminal representative stated: "A male and female traveler were late for a Ryanair trip to Amsterdam toward the beginning of today and touched base at the loading up entryway after the flight had shut. 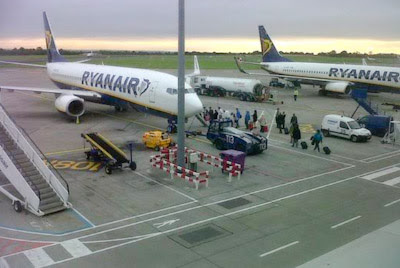 "They were connecting with Ryanair staff at the door and the male traveler was getting to be unsettled. "He was slamming against the window to attempt and get the flying machine to pause and he at that point got through an entryway and advanced onto the overskirt, endeavoring to wave to the air ship. "He was at first limited by Ryanair staff on the smock and airplane terminal police, who had just been reached, touched base on the scene very quickly and captured him. "He was taken to the Airport Police Station and will be given over to the Gardai (Irish police). "Ryanair stated: "Police at Dublin Airport confined a person who ruptured security at the boarding door, which had effectively shut. This is currently an issue for neighborhood police." As per air terminal administrator DAA, 14.7 million travelers went through Dublin Airport in the initial a half year of this current year.